DaySpring.com was started as a Christian greeting card company wanting to make Christ known through the printed message. Since then they have expanded to offer Christian jewelry, home decor, books, and much more. Share your heart and God's Will by shopping on DaySpring.com. Save extra money on your purchase with discounts, coupons and savings from 58Coupons.com. Get free shipping if you order of $25+ or more from DaySpring.com with this code! Click link and save. Don't forget to check out the clearance section on DaySpring.com where you can find savings up to 75% off select items. 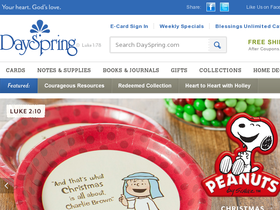 When you spend $60 or more on DaySpring.com, you can save $10 off your order with this coupon code. Act now to save 20% on orders of $100 or more from Dayspring.com. Use code at checkout. Act now and take advantage of a 15% discount on your entire order from DaySpring.com. Just use this coupon code and Enjoy! Check out DaySpring.com and you'll find that you can send Free e-cards.